"My family loves this. My husband even requests it." Combine the seasoning, salt, mustard powder, garlic powder and black pepper; set aside. Rinse the chicken thoroughly, and remove the giblets. 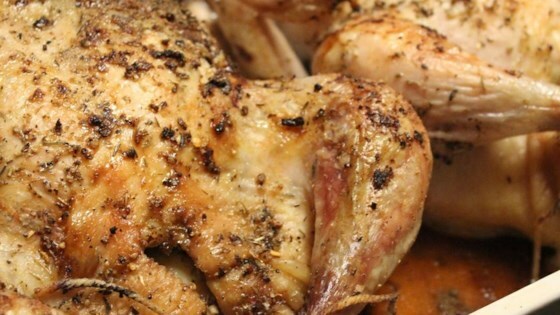 Place chicken in a 9x13 inch baking dish. Sprinkle 1 1/2 teaspoons of the spice mixture inside the chicken. Rub the remaining mixture on the outside of the chicken. Squeeze the juice of the 2 lemons into a small bowl or cup, and mix with the olive oil. Drizzle this oil/juice mixture over the chicken. Bake in the preheated oven for 1 1/2 hours, or until juices run clear, basting several times with the remaining oil mixture. Very good. I used boneless, skinless breasts; dumped on all the olive oil and lemon juice then sprinkled both sides with the herb blend. Tasty and tender. Baked at 350 for 30 min.